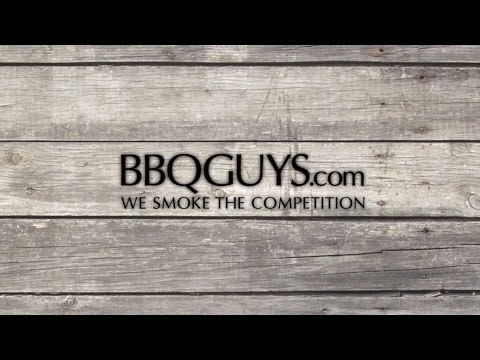 The American Muscle Grill revolutionizes the grilling world with its unique design and functionality which lets you choose your fuel. This heavy-duty, no-nonsense multi-fuel grill allows you to burn five different fuels all at once or separately, any way you choose. Whether your preference is wood, lump coal, charcoal briquettes, pellets, or natural gas, this grill can do it all. Designed and crafted in the USA, the AMG 36-inch built-in dual fuel grill is a masterpiece of innovation and precision. It all starts with the a front end borrowed from a 1969 Shelby GT 350 Mustang paired with 304 grade stainless steel construction and a spring assisted, 16 gauge double lined hood. 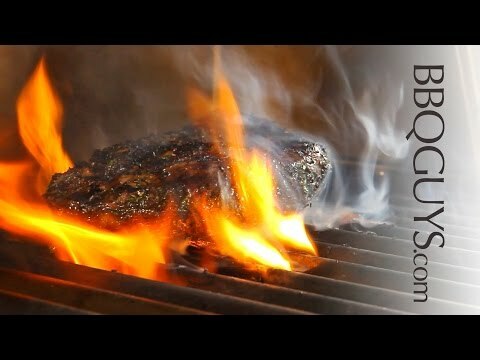 Inside the grill, the one of a kind cooking system is forged with five 22,000 BTU stainless steel tubular burners that deliver 110,000 BTUs of pure flame. The hemi-shaped, heavy-duty cast stainless steel V-Tech cooking grates are reversible, allowing you to grill a variety of food with ease. The convex side is for cooking beef, pork and other meat while the concave side is ideal for delicate items like fish and vegetables. Under the grates is a removable, innovative multi-fuel tray system made from 12 gauge stainless steel. Fill the trays with charcoal, wood, pellets, or any combination of your choosing. Then, use the gas to quickly ignite the fuel. The grill is ready to cook on within minutes whether using gas or solid fuels. 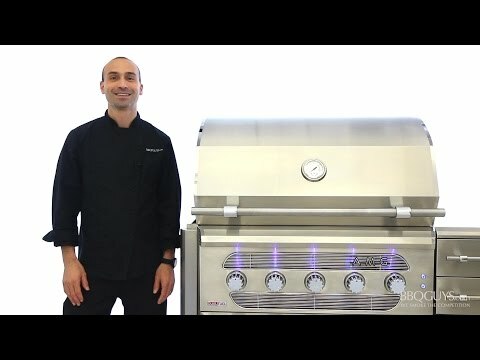 This grill also has a reliable, dual spark solid brass flame thrower ignition for effortless lighting without the need for batteries or electricity. High efficiency interior lights provide illumination for grilling at night while the blue LED control knob lights help you see the controls. Air vents in the control panel keep it cool to the touch, even when the grill is operating at high temperatures. The hood also includes adjustable vents for controllable smoking. A full width drip tray with an easy-clean drain system keeps cleanup simple. This incredible hybrid grill also comes complete with a grill head cover, leather gloves and a grid lifter / grate tool. The grid lifter can be used to lift the fuel trays and as a grate cleaning tool. The AMG36-NG has the features and flexibility to be the last grill you will ever need. Cooking Grid Dimensions 33 1/2 X 21 1/2"
When I first saw this grill, I fell in love with it. It is definitely a conversation piece when I barbecue with friends and family and the centerpiece of my outdoor kitchen. The grill cooks amazing as well. 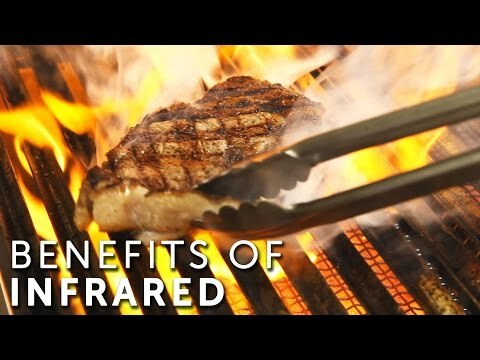 I highly recommend the searing grate if you cook steaks or burgers a lot as it sears great! So far, I have not had the chance to smoke with it, but hope to soon. Fantastic buy!!!! 33 1/2 X 21 1/2" 30 1/2 X 21 1/5" 30 X 22" 31 5/16 X 19"
35" 35" 31 1/4" 34 1/2"
25" 23 1/2" 23 1/2" 23"
15" 12" 12" 10 1/4"